Cupcake Crazy Gem! : South African Peppermint Crisp Fridge Tart...so good I made it twice! South African Peppermint Crisp Fridge Tart...so good I made it twice! This is the second time I have made this South African dessert, and I'm happy to say that this time I made it more authentic than the last time because now we're back in the UK there are South African shops all over where you can get Tennis biscuits from, and really if you're going to make this dessert and I hope you do because it's SO delicious then you're definitely going to want to try and do it right, coconut Tennis biscuits and all! Having said that there are South African shops all over, I had planned to go to one in Covent Garden a few weekends back that I have been to countless times over the years and when I got there I discovered it had closed down! Luckily, after some googling I discovered there was a little South African shop in an indoor market in the Stratford Mall and since I was heading to the new Westfield later in the day it fit into my plan quite well! So Randsavers saved the day! I made this dessert for my Zimbabwean mother-in-laws birthday dinner that we hosted for her that very evening so if it hadn't been for that shop I might have had to abandon the whole idea! This dessert combines coconut with caramel and peppermint in creamy, crunchy mouthfuls of deliciousness. As we sat down to eat it the two other South Africans at the table requested seconds...and even thirds! It really is that good! Serves 8 normal people, or 4 South African people! 397g Carnation Caramel, or if you're feeling brave you can boil a tin of condensed milk instead! Grease an 8 inch loose bottomed cheesecake tin. Crush Tennis biscuits using a food processor. Melt butter in 30 second intervals in the microwave. Mix the two together. You should be able to roll a ball of the mix without it crumbling, if it is not at that consistency you will need to add a little more butter. Press the biscuit mix into the bottom of the tin, using a tablespoon to press around the edges to ensure it is firm. Take spoonfuls of the mix and press them around the edge of the tin until it is completely covered. Bake in the oven for approximately 10-12 minutes or until it starts to go firm. Meanwhile, whip the cream until soft peaks form - you can do this in a stand mixer or using a handheld whisk. Add the caramel, caster sugar and peppermint extract. Beat until well mixed and then stir in 2/3 of the crushed peppermint crisp with a metal spoon. Spoon a 1/3 of the caramel mix over the crushed biscuit base and spread evenly. Add a layer of Tennis biscuits, then repeat with adding another 1/3 of the caramel mix. 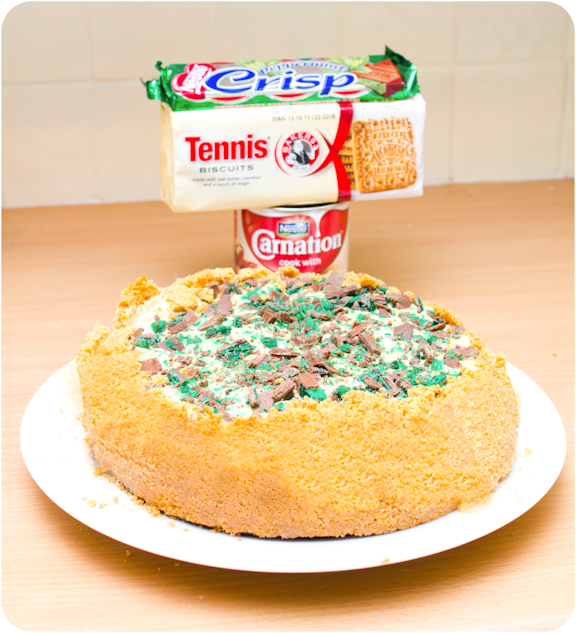 Add another layer of Tennis biscuits and a final layer of caramel mix. 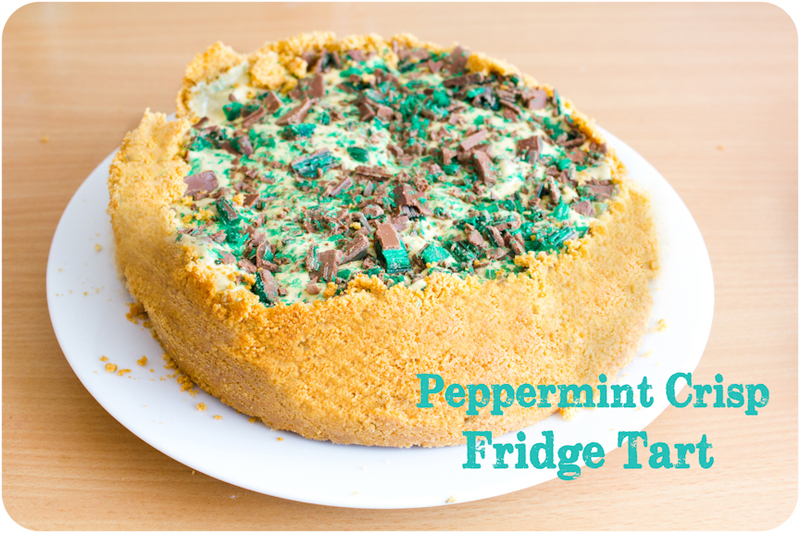 Use your leftover crushed peppermint crisp to decorate the top. Very carefully remove your tart from your tin! looks delicious and a lot of fun! Haha, that's great to hear! Thanks for having a look at my site, but sorry to have made you homesick for SA chocolates - who is this by the way :) ? London Town...and the best cupcakes around!